I really need to make this cake again soon. It was AHmazing. Even I surprised myself with how good it was and how rich, moist and flavorful it was for a gluten free cake. The dark chocolate cake made with Dutch process cocoa is key... regular cocoa isn't going to give the same results. These would be great as cupcakes as well, if you don't want to deal with layer cakes. Preheat the oven to 350F. Lightly grease two 8" or 9" round pans. In a medium mixing bowl (not the bowl of your stand mixer), whisk together the sugar, gluten free flour blend, cocoa, baking powder, salt, and xanthan gum. Bake the cakes for 30 to 33 minutes, about 3 to 4 minutes past the point where a toothpick inserted into the center of one comes out clean. The cakes' internal temperature should be 210F. In a stand mixer afixed with the paddle attachment, beat together the butter and powdered sugar on low until well-blended. Add the Nutella and increase the speed to medium. Beat for two minutes. Add the vanilla extract and salt and whip for an additional 30 seconds. Add the whipping cream and beat for about one minute, until the frosting lightens slightly in both color and texture. Normally I am not a massive chocolate lover - when it's paired with peanut butter that's different. But when it comes to hazelnut chocolate anything I must have it. What a beautiful cake Joelen, Gluten free or not I would welcome it anytime. BTW my hometown is in SW Michigan, right across that big pond from you. This cake looks phenomenal! 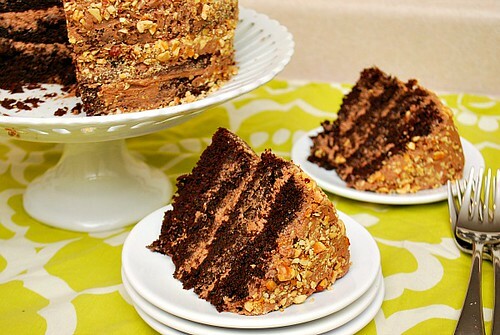 Love all the layers and nut coating, yum!